The Pyle Hand-Crafted Bongo Drums feature hand-crafted wooden shells. 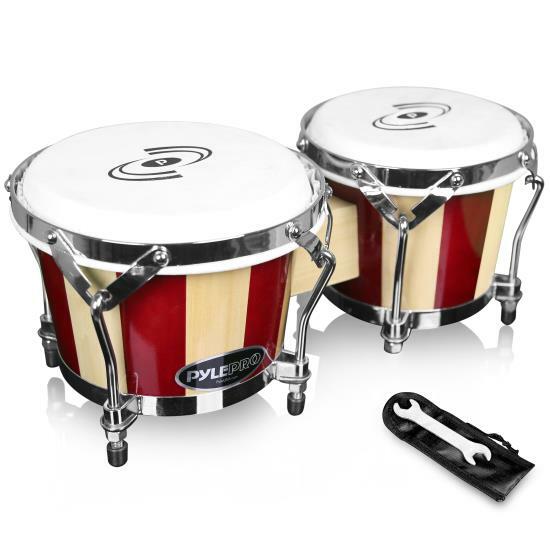 Classic and traditional bongo style makes them the perfect pair for beginner and experienced players of all ages. The natural ‘true skin’ animal hide head covers reproduce clean acoustical percussion sounds. Additional bongo features include tune-able heads with chrome-plated hardware, two-toned side panels with glossy finish, along with an included tuning key wrench. Add some sound, and style, with the Pyle Wooden Bongo Drums.